Engraved on headstone – Matthew Haskins Sweet, born 27-6-1808, Bristol, England. Died 8-5-1888 Blackwood. Son of John and Elizabeth Haskins. Husband of Mary (nee Kelly) Sweet. Father of Elizabeth, Thomas, Eliza, George, Catherine, Stephen, William, Matthew, John and Albert. Arrived in Australia on the ‘Champion‘ 1827. ‘Second man on the Blackwood Goldfield’. Erected by his descendants 2001. Also Thomas Sweet. The History of Blackwood – PIONEERS of Blackwood. 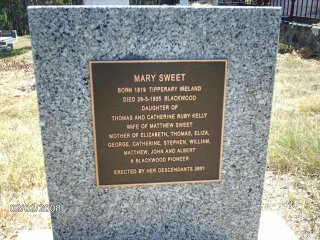 The Sweet family have long been remembered in Blackwood as early pioneers. Especially the late Walter Sweet and the last matriarch of the family, Barbara Sweet. Mathew was born to John and Elizabeth Haskins on 27th June 1808 in Bristol, England and baptised on 31st July, 1808 in St Pauls church, Portland Square, Bristol, England. 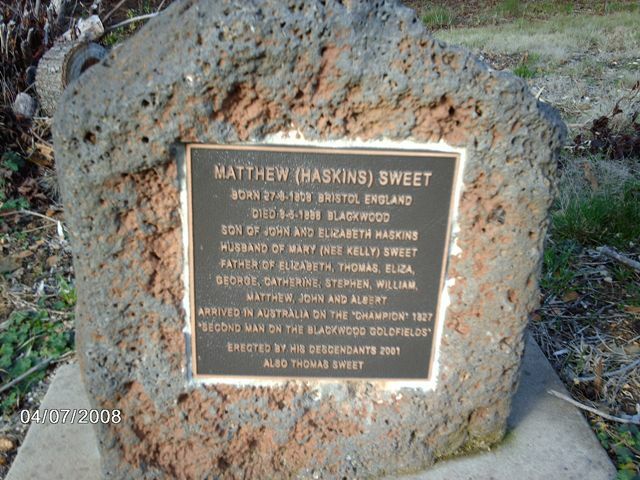 From available records, Matthew Haskins alias Sweet, was transported to Sydney Cove on the convict transport ship ‘Champion’ on 24th May 1827, to serve a 7 year sentence. He was granted a ‘ticket to leave’ on 15th Dec, 1832, then his ‘Certificate of Freedom’ on 22nd Nov, 1833. He moved to the District of Port Phillip, in Victoria and worked for Mr Willis on Willis Station in the Upper Glenelg area , where he met Mary Kelly. Matthew Sweet married Mary Kelly in Portland Bay in 1842 and in November, 1854 with their six children, packed up and moved to Golden Point, Blackwood to pan for gold with George Jackson. From my book ‘Aspects of Early Blackwood’ I have records of his arrival in Blackwood. Matthew Sweet was referred to earlier in the beginning of the gold rush to Blackwood. After Edward Hill’s discovery of gold in Blackwood in January 1855, Hill came down to Melbourne and made the news public in early 1855 in the ‘Argus’, and the rush was on. As John (Jack) Sweet was born in 1855 in Golden Point, the author procured his birth certificate which proves he was possibly the first child born on the Blackwood goldfield. Born 24th July 1855, Golden Point, Mt. Blackwood. Father, Matthew Sweet, Sawyer age 47 yrs. Mother, Mary Kelly, age 35 yrs, born in Ireland. Married in 1842 in Portland Bay, with eight children living and two deceased. Doctor was Dr. Caesar Keiser and registered on 30th July 1855. Thomas Sweet born March 7th 1843 – Portland, Eliza Sweet born December 13th 1844, George Sweet born July 27th 1846, Stephen Sweet born March 22nd 1848, Catherine Sweet born March 7th 1850 – Portland, Elizabeth Sweetborn November 19th 1851 – Portland, Matthew Sweet May 19th 1853 – Ashburton, died age 2 yrs. John Sweet July 24th 1855 – Golden Point, Blackwood. William Sweet born May 6th 1858 – Blackwood, Albert Sweet bornFebruary 1st 1862. Thomas SWEET, married Martha Dolphin 1865, and had 3 children in Blackwood between 1866 and 1876. Eliza SWEET (b 1844 Portland, d 1902 Carlton, 57y) married 1865 Timothy DWAN. Eliza and Timothy Dwan had 8 children born in Blackwood between 1866 and 1881). Catherine SWEET 2nd daughter of Matthew Sweet married Robert William Carruthers of Blackwood and 6 of their children were born in Barrys Reef, Blackwood, between 1878 and 1888. Elizabeth SWEET –3rd daughter of Matthew Sweet married William Webb Dudley and had 10 children. John SWEET born Blackwood 1855 married Sarah Sophia Saville in 1878 and had 6 children from 1879 – 1894. William SWEET born Blackwood 1858 married Harriett Sophia Taylor in 1888 and had three children in Blackwood from 1889 – 1894. William Sweet died 1916 Heidelberg, 54y. From the above records we can glimpse a story of how Matthew Sweet brought his wife and 6 children with him to Blackwood and they were there in July 1855 when his wife gave birth to their son John (Jack). How hard that must have been for her, living in the rugged wilderness in a tent with 6 young children and a new born baby. We really must admire those early pioneers and the women. Further records show another glimpse of the family, while searching Trove on-line. When searching your family history further research can add stories to fill in gaps in the family history to give you an idea how they lived and died. A sad accident happened to a man named John Sweet at the New North Britain claim on Tuesday morning. It appears a shot missed fire in the mine, and after a considerable time he went to see the cause, when it exploded in his face. He was conveyed to the Kyneton Hospital the following day. It is not yet ascertained if his eyesight is injured. He is badly cut about the head and face. No injury has been done to his limbs or body. A further report said he is likely to lose his sight, as unfavourable symptoms have set in. A further report 4 years later found in TROVE – Bacchus Marsh Express- Saturday 31 December 1887. Matthew Sweet Snr. died 7th May 1886 at Blackwood age 77 yrs, and was buried in the Blackwood cemetery C of E, section 33. Thomas Sweet 1st son of Matthew Sweet died in Blackwood 6th April 1890 and was buried with his father at Blackwood. 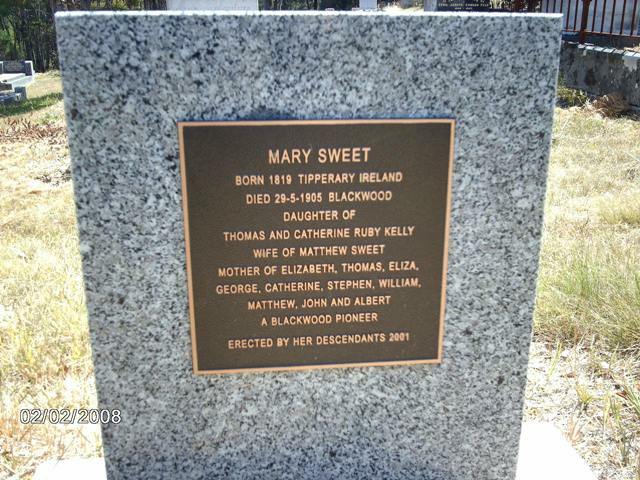 Mary Sweet (nee Kelly) died 29th May 1905 and was buried in the Blackwood cemetery, R C section M 41. Found on Trove – Bacchus Marsh Express – Saturday 3 June 1905. – By the death of Mrs. Sweet, relict of the late Mr. Matthew Sweet Blackwood has lost an old and respected resident. Deceased arrived in Blackwood with her husband and family over 50 years ago, and was the first woman on the gold field. She was 87 years of age, and up to Friday last attended to her household duties. On Friday last she was seized with a paralytic stroke, from which she succumbed on Monday night. Found on Trove – Bacchus Marsh Express – Saturday 8 December 1894 – An accident occurred with another mining accident, the sufferer in this case being a young miner named Thomas Sweet, who, while engaged in timbering some broken ground in his party’s claim, near Simmons’ Reef, got his collar bone broken by a fall of earth from the side of the drive. He was at once taken to Trentham, where Dr. Sleeman gave the necessary surgical assistance, and the patient is doing as well as could be expected. The accident was climax to a long run of bad luck. Found on Trove – Bacchus Marsh Express – Saturday 25 November 1911. One by one the old pioneers of Blackwood are passing away, like landmarks removed from stations they have occupied so long. We miss many of them, and by reflecting how many of them have joined the great majority, and that a new race has indeed sprung up in Australia since the discovery of gold brought its tens of thousands to these shores. Mr. George Sweet, whose death we are just called on to deplore, was well known amongst us as a capable mining engine driver, being connected with the principal mines of this district for a great number of years. The. deceased was born at Portland in the year 1846, and was consequently at the time of his death, which occurred about 4 o’clock on Friday morning, 17th November, at his residence, Golden Point, in his 65th year. Catherine Sweet, E.W. Sweet, Elizabeth Sweet, George Sweet, John Sweet, Lucy Sweet, Martha Sweet Mary Sweet, Matthew Sweet, Maysie Sweet, Walter Henry Sweet, William Mathew Sweet, Harriet Sophie Sweet, Winifred Louise Sweet, Thomas Henry Sweet. click to enlarge photo. Headstone on grave of Mary Sweet (Kelly), Blackwood cemetery.